I found your site, like most, by luck!!!! and have spent a lovely hour reading through it -what a lovely place Wrington seems to be. The reason I typed in "Wrington" is because my Great Grandfather FREDERICK HABERFIELD was born there in 1872, but I could not find anybody researching Haberfields on the site. I have come to a standstill at Wrington with my Family Tree and hope there maybe somebody there that may have heard of the Haberfield Family - as I am sure in the 1870's it would have been more like a Village with everybody knowing everybody...... like the little villages here in W.Wales. My Great may have come from farming family and left home to work in Wiltshire where he met his wife Rose Georgina Victoria Ralph b. 1873 in Caine Wiltshire whose father Walter William Ralph was a miller and they married in Axbridge in 1894. My Nan, Dorothy Louisa Rose Haberfield was born in July 1895 in Cheddar and they had 4 more children , moving to Bristol, Guisborough and then spending the twilight of their years in Chesterfield Derbyshire near their daughter Eunice Madge. My Nan married James Robson Hills in Guisborough but through a farming life came to South Wales and raised their family - so another Wrington connection with wonderful Wales. Any information you can find, I would greatly appreciate as my Nan rarely spoke about her parents and their siblings etc although my Nan & her siblings kept in touch although living in Derbyshire. Sadly all gone now, so no one to ask anymore. I will visit your site to keep up to date now I have found you - well done on its progress. [The website]'s been on my favorites for a long time. I was born in Wrington 1960. l left in the eighties but still a regular visitor as my mum still lives in Lawrence Road. I went to Sunday School at the chapel , the village primary school ( my teachers included Mrs Hodges, Mr Peerless , Miss Lewis, Mrs Wade , Mrs Collins and of course Mr Dyke. I was in the cubs and scouts and played for the village football teams. I still consider home and know how lucky I was to have grown up in such a wonderful and enriching community. I make sure my children know their roots , and take them to see the iron ring my grandfather Oliver Millard put in the bridge over the brook to tie the shire horses from the farm up so they could drink. It’s amazing how things come about. It’s unsettling the feeling of butterflies in the stomach. I hadn’t expected that. I hadn’t really thought about it from that angle. It all started so long ago. How time has flown. It’s funny really, how you raise your kids and keep a watchful eye on them as far as internet use goes. How you warn them about the dangers. How you hope they won’t fall prey to undesirable characters, or form a possibly precarious relationship with someone on the net whom they really don’t know. You spend all that time & worry on your kids, and it doesn’t come onto your radar that you could also be sucked into the vortex of the internet. It all starts so easily somehow. You learn a few basics, develop your confidence, become curious, investigate, become even more curious, and before you know it you are hooked. Hook, line and sinker. An addiction really. Who me? An addict? I wouldn’t really say that, or admit it to others  but yes, I guess I am, and now look where it has led me. I’ve been awake during the night, contemplating my actions. I’ve gone over all aspects of my decisions. I’ve justified them all to myself, to my kids, to my friends, and just to reassure myself, I justify it all over again to myself. Really, if it was any of my children doing this I would be questioning their sanity, questioning their level of responsibility, and questioning them again. I’d ask them to reconsider, think of others, don’t do anything foolish. But this is my decision. This is me being selfish. I’ve been sensible and made safe decisions for decades. While not throwing caution to the winds completely, I am throwing away the shackles. I want to live, to be alive, follow my heart's desires, my deepest desires. I want to put some excitement and adventure into my life. I want to let the winds of the unknown blow the cobwebs from my staid & safe existence. Yes I am nervous, and the butterflies are wreaking havoc in my stomach. It is such a long way. Some have tried to convince me not to come, not to flirt with danger. However my yearning to fulfill a dream from my bucket list has made me steadfastly determined. There are too many undone things on my bucket list, and time is not on my side. The grey hairs and creaking knees are testament to that. But why should age and its unwelcome accompaniments stop me from following my heart and achieving a dream? I dress carefully. Pity I hadn’t continued that diet and exercise regime I promised at New Year. A few less bulges would have been a big improvement. I double check my hair, my makeup, my shoes. Too late now. I will have to pass muster as I am. I’m finally on the threshold, clutching gifts in my arms. I have come all the way from Australia to New Zealand. Will we recognize each other? Photos we exchanged on the net weren’t all that clear. Our one phone call was brief, very brief, but the accent was charming. The butterflies swarm. After years of emails will we like each other in the flesh? We do have some things in common, the village of Wrington in Somerset where our ancestors came from, a love of research, a desire to meet. Will it be enough? One hears of love at first sight, or hearing bells, but when the crucial moment comes I had not expected this…to be greeted by a hug during the seismic activity of Christchurch, New Zealand. I finally meet my distant cousin, and present him with a copy of my Parker Family research. Note: At the time of sending this, unfortunately, the earthquake activity continues, and our thoughts go out to all those who have been so badly affected. My father is Tony McCafferty. I am the grandaughter of Edna (née Millard) and Chris Wilkins. I spent a lot of my childhood in the village and enjoyed Sunday school at the URC chapel where I was baptised. I'm interested in the photographs [of the Home Guard] on the village website. My Grandfather - Leonard Pearce- lived in the village at the time and was in the home guard, or the LDF, or both. My Mum (then Betty Pearce, now lives in Weston) thinks that one of his duties was to guard the bridge by which the A38 crosses the River Yeo (Perry bridge?). At first inspection, i don't recognise him in either of the photos- but will need to check more carefully; he may not have been an NCO. Thank you Richard. Great website! Larry has already been in touch with me and we will continue to pursue our common interests both in the UK and Australia. Perhaps I may find more connections on your website as time goes by. Thank you Richard, It just shows how well your website is working and its benefits. You're my first relative from down under. George Williams was my great great grandfather, so that makes us of the same generation. George moved into Bristol from Wrington where he married Elizabeth Westlake. After their children were born, they moved to South Wales (the old one, not the new one) and eventually settled in Cardiff. I still live about 10 miles outside Cardiff, at Barry. I've attached a file with the family info and it shows George and Harriet's grand parents, which may be of interest to you. This is as far as I have managed to trace the family at present, but I normally do a bit of research every year during the cold UK winters - when you're probably enjoying a barbie on the beach. I would appreciate any further information on the family that you may have and of course if you ever decide to visit the UK, let me know and maybe we could meet up in Wrington. My daughter and I are researching our family history. 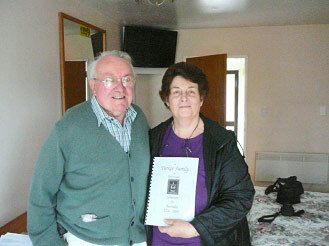 We notice that Larry Cody is also researching the family of Paul Williams and Sarah Broad from Wrington. I would be pleased if you could forward my address to him for contact as he may be interested in the Australian branch of the family. George William's sister Harriett married James Jones a coal miner and they emigrated to Australia in 1858 and settled in the coal-mining area of Newcastle. Harriett was my great, great grandmother. Please could you help? I am researching my family tree. My Grandmothers maiden name was Bathard. I know she originated from Wrington. If anyone could assist with giving me more information I would be most grateful. I have lived in Blagdon most of my life and only just started researching this side of my family. Many thanks for the “Wedding Peal” which issued forth from All Saints' Tower lately. My compliments to the Tower Captain and all concerned. I have just treated myself to a shiny new HP computer and, upon connecting to a reasonable sound system, the resultant tintinnabulation was very impressive. My husband and I will be visiting relatives in Wrington from June 17th to June 27. I am a professional violinist hoping that there might be people interested in playing chamber music for fun. Very much enjoyed looking at your site. Even spotted a photo of myself in the Wrington School 1963 photo (Bottom row, 6th from the right). I lived in Wrington from around 62 to 68 at Orchard Close at Number 21, a bungalow in the corner site..
Out of interest, a few other names I remember are Margaret Morewood who lived next door but 3, Ian and Guy Young, at the bottom of the road. The Gardeners?, the Buglers who ran The Plough, Spaldings Chemist which also sold toys as I remember. Also Dr Tricks and the Headmaster of the school Mr Dyke. Also remember going to the Memorial Hall where, on occasions, a guy used to show films which was a treat as obviously, there was no cinema in the village. I also remember a lad in the photos called Robert Cox. Many happy memories of Wrington, congratulations on a wonderful site. Photographs of the local businesses and the shopkeepers i,e, Amors stores and the Hardware shop I think was owned by either Parsley or Farley. Would you like to place this on your website, it is my grandmother's christening certificate from Wrington. She lived in Myrtle Cottage with her 4 brothers in the 1900s. One stayed in Wrington - his name was Charlie Chard. Maybe someone somewhere it will be of interest to. I have let John King & Lyndley Havyatt know [about Tim Bush's inquiry]...John is travelling New Zealand at present & I will go there to meet him next week. Thank you sooooo much for your wonderful web site. I do check it from time to time. I also hope to visit Wrington either this year or next....just have to get organised. 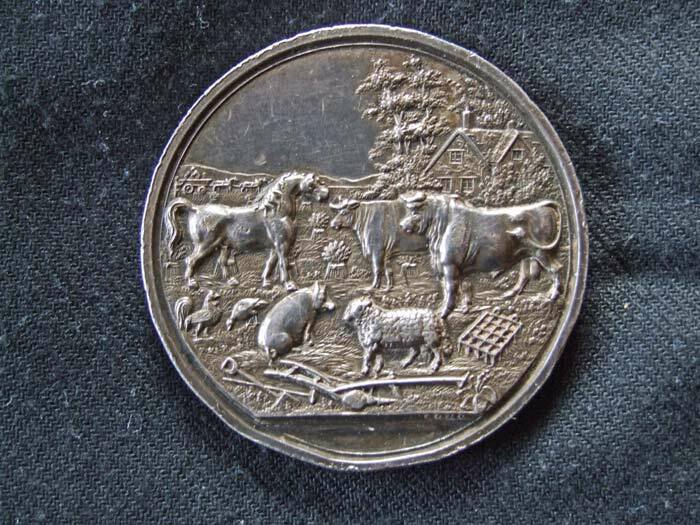 I noticed on your village website a description and pictures of the Wrington medal, you might be interested to know that I have one that was presented to my ancestor William Parker on October 29 1841 inscribed as owner of best Bull. William farmed Havyatt Farm at that time, later it was farmed by his son George. 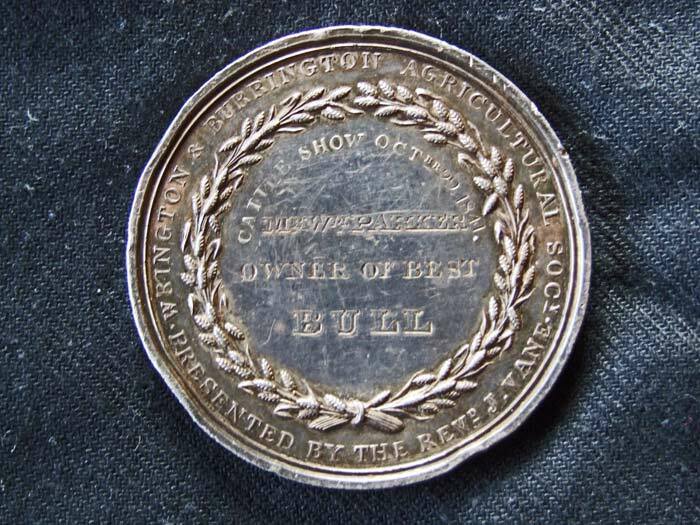 I would like to know if any more of these medals are still around, how many were ever presented etc. mine does not appear to be bronze, it is silver coloured, possibly plated. 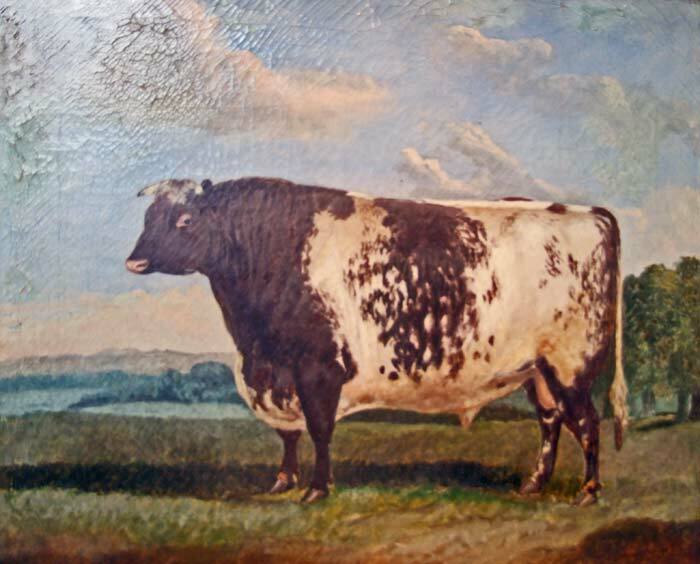 I also have an oil painting presumed to be of the winning bull. I also notice that there are other descendants of George Parker seeking information on your site so for their information George had 17 children with ,2 wives, I am descended from his second wife Rachel, who farmed Legges Farm, Wrington in her own right after his death. I would be interested in contacting any other descendants. I am quite impressed by your work. Congratulations. I incidentally came across the name "Chard" as I searched with Google for my own family name on the web. 1- The name "Chard" derives from my own name "Cahard" when dealing with the administrative employees of the old days (and not only...). When spelling my name 9 times out of 10, they miss the first "a". I am acquainted with a person here in Alsace whose name is also Chard. He pronounces his name as we also do in Normandy with my own spelling i.e. : "Karr". 2- The name "Cahard" has a Danish origin: "ca" = "kô" = war; "hard" = "good at", which would mean as much as "good or brave warrior". This indicates "Viking" origins with little doubts. Our epicenter for the Cahards is in "Doudeville", Dept "Seine-Maritime" in Upper Normandy. My father made researches that led him up to 1614, where 3 brothers appear in a church register. It was impossible to go any further up the tree. 3- My branch is in Fécamp (in Seine-Maritime - Upper Normandy) that used to be the n°1 French cod fishing harbour (salted), but also a fresh fish fishing harbour (herings). "Fé" = "Fisk" = "Fish", (+ camp). All these sailors (among them "Cahards" too) went fishing everywhere in the Channel but also around the British Isles, and stopped to shelter, or rest, or refuel in the British isles. Interesting is to know that they often stopped in South-Wales to refuel with coal once they had steam ships. It was not unusual to lose sailors in those fishing campaigns. They disappeared at sea, but also simply disappeared. For instance, that was once the case in my branch sometime around 1870. We all know that the Vikings went everywhere and invaded the British Isles starting with the Faroes over the Orcade and down Scotland to North England, Wales and Ireland, not forgetting the direct attacks on the eastern coast and the invasion of William the conqueror. However, that "spelling" derivation seems rather "young" in history for the church registrations are "young" too. Local clerks with identical origins could make lesser copy mistakes in their own old languages, wheras the XIXth and XXth century population mixing favoured them, especially Latin v. Norse when unifying our modern national languages. 4- As much to suggest Mrs Marlene Shaw to try researches in Cornwall and Wales on the name "Cahard", wheras she might be surprised to find a copy mistake leading to the "Chard" family if she ever had an abrupt hyphenation in her ancestry.